It's the Friday after Thanksgiving, so it's time to consider what you want to buy that special someone for Christmas. If you celebrate Christmas, that is. If you don't, then you need to decide what to stuff in their Advent calendar, unless you get them a prefilled Dr. Who Advent Calendar. I'm not making that up, by the way. They were selling them in the groccery store when I was in London. I almost bought one for Pooteewheet, before settling on a bag of Jelly Babies. But Jelly Babies aren't for everyone. Certainly not for anyone who was at Thanksgiving yesterday, where they were roundly denounced as chalky and "not good". Strong language for Minnesotans. So, when they just won't do, get out your currency converter and American Express and order your loved one a Jordan ironing cover from TVShop.com. Iron over her bikini and watch it disappear! I think that's sort of counterintuitive. After all, you've just covered her up with a shirt that needs de-creasing, so what are you really going to see? On the other ironing board, Mark B here needs a flannel shirt and waders. Because I don't want to see him lying around without that towel. I wasn't sure I wanted to see Jordan without her bikini. Nothing personal, J, I've just seen you talking in that Katie and Peter show, and that quashed any desire I might have had to see you naked (for a treat, read the personal life section on Wikipedia). But Mark...I can't even find enough on him on Wikipedia to know whether he has redeeming qualities other than that towel. As near as I can tell, he's a WWI tank, although I don't think the ladies will be impressed or as anxious to remove the towel once they learn that his full name is "Medium Mark B" and all he's sporting is a 7.92 mm Hotchkiss. 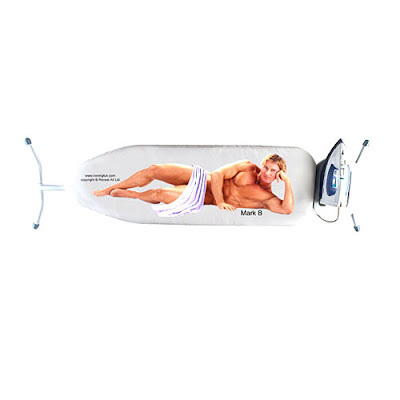 I noticed that TVShop refers to it as the "cheekiest ironing board cover money can buy", which begs the questions, "what do you get if you're not using money?" and "he's facing us...is that really 'cheeky'?"